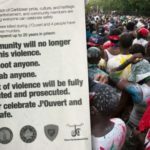 One man was shot in the back during the early morning J’Ouvert festival in Crown Heights, while two women were also injured by gunfire in the hours before the start of the festival. 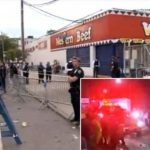 One man was reportedly shot in the back on Monday morning at 7:30am during the J’Ouvert festival, ahead of the West Indian American Day Parade, on Nostrand Avenue and Park Place, which is outside the official parade route. Two additional women were shot on Sunday evening ahead of the event on Flatbush Avenue and Herkimer Street. One of the victims was stuck in the elbow, while another was grazed in the leg. All the victims were taken to nearby hospitals and are expected to survive. Last year organizers of the festival, working together with law enforcement and local elected officials, changed the start time of the event from 2:00am to 6:00am and added hundreds of light towers and additional police officers in an effort to curb the violence which was often synonymous with the event. The changes seem to have paid off with significantly less violence and injuries reported this year, as well as the year before. After hearing about the violence which constantly plagues the West Indian Day Parade and the recent crime on Jewish victims getting mugged assaulted, stabbed and strangled, I do notice a pattern. They all happened during a Donald Trump Presidency. I applaud our Politicians on raising their voices against Donald Trump who is responsible for causing the recent violence on innocent people ( baby pictures of the shooters not available for this article). No, you got it all wrong, it is because of Bill Deblasio the mayer and all of he democrats that you help elect that are soft on crime. To #1. Make Brooklyn great again. in regARDS TO#1 IF DON’T KNOW THE FACTS KEEP YOUR COMMENTS TO YOURSELF! #1 is being sarcastic, it is all de blasios fault and the kiss ups to him that CLAIM to represent us. Next year in addition to the 4,000 nypd cops, i propose 20,000 national guardsmen with armored vehicles, tanks, and artillery batteries. Maybe, just maybe, that extra security help will inspire a parade with ZERO shootings. Thank you #9 & #12. I was almost going to go back to the Borscht belt, since this seemed like a rough crowd. All joking aside, the problem is guns and individuals who have a gangsta / criminal attitude. Until then I can only dream of surveillance cameras on every street corner with license plate reading technology, shot spotter listening devices, and a Shomrim Drone with a Yarmulke on top chasing down the bad guys. I read that they dip themselves in motor oil and go nuts. Classy huh? When will they put an end to this disgusting parade. Time to call it quits. Come on, people. Was “(baby pictures of the shooters not available for this article)” not enough of a clue for you?